The MECCA name is returning to Downtown Milwaukee. Published Feb. 7, 2019 at 5:16 p.m. The MECCA name is returning to Downtown Milwaukee – just not attached to the original Milwaukee Exposition, Convention Center and Arena. Instead, it'll move just down the street from its former home to the new MECCA Sports Bar and Grill, coming to the entertainment block outside the Fiserv Forum. The MECCA Sports Bar and Grill is fourth tenant announced for the live block area, joining Punch Bowl Social, the new Drink Wisconsinbly location and the freshly opened Good City Brewing as well as the space's beer garden. 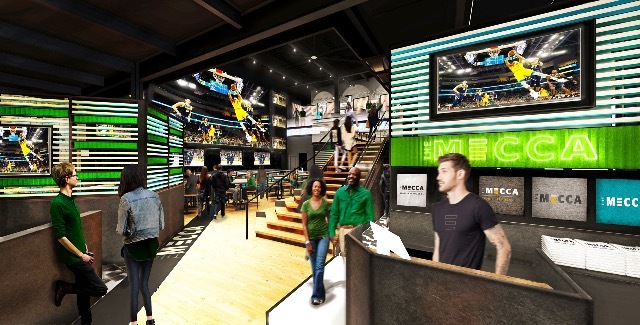 "The MECCA Sports Bar and Grill will be a major attraction for Milwaukee's passionate sports fans," said Michael Belot, Senior Vice President of Bucks Ventures and Development, in a press release. "The Entertainment Block has a bold future, and we are proud to give homage to the Bucks' rich past by bestowing the sports bar and grill with the MECCA name." Moving into the same central building as Good City Brewing, The MECCA Sports Bar and Grill will feature two full-size bars and a variety of seating for 600 patrons scattered across two floors – from outdoor seats on both levels to the large main bars and arena-style seating on the second floor. Most important, however, for a sports bar and grill, The MECCA will include state-of-the-art sound and picture – including a 36-foot HD screen centerpiece – for watching sports of all sorts. "We are thrilled to extend our esteemed food and beverage program beyond Fiserv Forum into The MECCA Sports Bar and Grill," added Justin Green, Vice President of Hospitality for the Bucks, in the release. "Guests will enjoy an elevated sports bar culinary experience with incredible versions of sports bar fare along with signature items that will surprise and delight." The MECCA Sports Bar and Grill is expected to open in late April. Stay tuned to OnMilwaukee for more updates on The MECCA and other entertainment block updates.